White House press secretary Sean Spicer fielded questions from more than 40 reporters for over an hour on Monday. But it was a half hour before Spicer was finally asked to confront the gorilla in the briefing room. Jon Karl of ABC News had a question about the "nature" of Spicer's new job in the wake of the press secretary's angry, error-filled statement over the weekend, when he upbraided members of the media for reporting accurately on the size of the crowd at President Donald Trump's inauguration. "Is it your intention," Karl asked, "to always tell the truth from that podium and will you pledge to never knowingly say something that is not factual?" Spicer said he does intend to be truthful on the job and, over the course of a nearly 10-minute exchange with Karl, owned up to telling at least one falsehood during his statement on Saturday. It was wrong, Spicer conceded Monday, to claim that more people used the Washington, D.C. Metro on the day of Trump's inauguration than on the day President Obama was sworn in four years ago. Karl was the eighth reporter called on at Spicer's first official White House press briefing, a lengthy but civil affair that stood in contrast to the combative posture taken by Trump and his team over the weekend. But the briefing still provided a glimpse at the administration's new approach to media relations. In fact, before he even took questions, Spicer revealed a change in the White House's dealings with the media, announcing there will be four "Skype seats" at the briefings designated for reporters who do not live in the Washington, D.C. area. 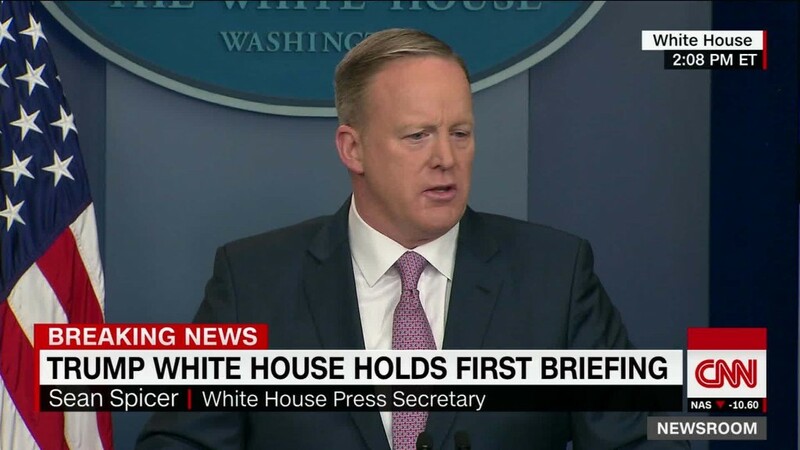 Spicer then started by calling on the New York Post's Daniel Halper, breaking with a tradition to give the first question to the Associated Press. The author of "Clinton, Inc.," a book critical of the Clintons, Halper asked about the Trump administration's plans to build a wall on the U.S.-Mexico border and enforcement of the Affordable Care Act mandate. Halper was one of at least three reporters from Rupert Murdoch-owned properties to get a question on Monday. John Roberts and Blake Burman, of Fox News and Fox Business respectively, were also called on. Ditto for Trey Yingst, the White House correspondent for One America News, a small, conservative cable channel. Yingst, the 11th reporter to pose a question to Spicer on Monday, was also called on at Trump's first post-election press conference earlier this month. But Spicer, who took questions from 43 reporters over the course of 79 minutes, did not shun outlets that have clashed with the president either. The third question of Monday's briefing went to Janet Rodriguez of Univision, the Spanish language giant that rankled Trump throughout the presidential campaign. Spicer later called on Jennifer Bendery of The Huffington Post, the liberal website that for months throughout the 2016 race ran a disclaimer on all Trump-related stories calling the president "a serial liar, rampant xenophobe, racist, misogynist and birther." Bendery was the only reporter at the briefing to ask Spicer a question pertaining to climate change. Spicer also granted a question to CNN's Jim Acosta, the White House correspondent who had a testy exchange with Trump at this month's press conference. Acosta, who was called on about an hour after the briefing began, brought the discussion back to the debate over the inauguration crowd size. "Why make this crowd size issue something to talk about at all?" Acosta asked. "Why get into it?" Spicer said it was "not just about a crowd size," which he asserted earlier in the briefing was the largest to witness an inauguration in-person and on television combined. Related: Reality Check: How many people really watched Trump's inauguration? Repeating his pledge on Saturday to hold journalists accountable, Spicer complained that the press was too hard on Trump and had failed to recognize what he said were sacrifices made by the president. "The default narrative is always negative and it's demoralizing," Spicer said.